Located very pleasantly in section twelve, township thirty-two, range eight, is to be found the estimable gentleman whose name introduces this biographical writing. Mr. Steinbach is well-known throughout the locality in which he resides, and highly respected by his fellow men. Mr. Steinbach is a native of Bohemia, being born in that country in the year 1886; and he is the son of Thomas and Eva Steinbach, both natives of Bohemia. When our subject was a small boy, he, with his parents, left the land of their nativity to come to the land of plenty, the new world of which they had heard such promising accounts. The family embarked on the steamship "Columbus" from Bremen, Germany, and after a voyage of six days, landed in Baltimore, Maryland. After landing on American shores, they immediately started for the west, locating in Saunders county, Nebraska, where they remained one year; later coming to Knox county, where they took up a homestead on which they built a sod house. On this homestead our subject spent his boyhood days, attending school, and during vacation times helping his father on the farm. Here the family endured the many hardships and unpleasant experiences incident to those first days of pioneer settlement, and Mr. Steinbach can relate many interesting stories connected with those early days on the western frontier. Mr. Steinbach was united in holy matrimony in 1909 to Miss Mary Clinch, and Mr. and Mrs. Steinbach have the friendship and good wishes of a host of friends and acquaintances. John Calelly, proprietor of one of the most valuable estates in Stanton county, Nebraska, has been a resident of that locality for a number of years. He is recognized throughout the northeastern part of the state as one of the foremost farmers and stockmen of that section. After many years of hard labor in building up his business, he is now prepared to enjoy the remaining years of his life in peace and comfort, surrounded by a host of friends and acquaintances. Mr. Calelly is a native of New York state, and was born September 13, 1854, the son of Barnie and Julia Calelly, both natives of Ireland. The parents came to America in the early days, when ocean traveling was done entirely by means of sailing vessels. Their trips across the ocean consumed forty days. The childhood and youth of the subscriber was spent on the farm in New York state. The family came west in 1869, and settled in Douglas county, Nebraska. The subscriber remained at home, helping his parents, for some years. In 1885, he was united in marriage to Miss Mary McInery. Two years later, in 1887, Mr. and Mrs. Calelly drove from Douglas county to Stanton county, where he took up a homestead, which has been their home ever since. At that time, he put up the frame house which has sheltered them for so many years. Many extensive improvements have been added to the farm since that time, and it is now one of the most valuable estates in the county. Mr. and Mrs. Calelly are the parents of seven children all of whom are living. They are named as follows: Mary, Blanche, Margaret, Fannie, John B., Theresa and Clarence. Mr. Calelly is a public-spirited man, of untiring energy and perseverance, and enjoys an enviable reputation among the people of this community. No one holds a higher place in the estimation of the citizens of Creighton, Nebraska, than the venerable Andrew Hengstler, now retired from active management of his broad acres. He is a native of the village of Aldingen, Wittenberg, Germany, born July 27, 1838. In his native country he followed farm labor until 1864, when he came to the United States and worked in the mines of Michigan three years. Here often a nugget of silver was to be found in the veins of native copper, and Mr. Hengstler has a ring and watch case made from that metal, which he found thus while delving in the mines. On his first voyage across the ocean, Mr. Hengstler sailed from Bremen and was eighteen days at sea. During the severe storm of their passage the vessel was given up for lost, at times there being eighteen inches of water in the cabin in which our young emigrant with his fellow passengers were battened down. Mr. Hengstler remained in America three years, then returned to Germany for a visit of about six months, and then came back to the United States. On his second trip over, a large party of our subject's fellow villagers, five men and twelve girls, including his present wife and a number of her sisters and brothers, set sail for the new world. Leaving home the 7th of September, they sailed from Bremen the fourteenth on the "America" and landed on the twenty-eighth in New York. Sojourning for a time in Cincinnati, Ohio, Mr. Hengstler joined his future bride and her party at Madison, Ohio, where a brother had preceded her. Together they all came to Nebraska and in November, 1867, found employment in or near the fort at Cottonwood Springs in Lincoln county. Mr. Hengstler worked in the canyons with others getting out wood, and after their marriage Mrs. Hengstler cooked for the large party of teamsters and wood-choppers of the fort, at which her husband assisted her. They next occupied a farm in Saunders county, near Fremont, from October, 1869, until 1872, when they filed on a homestead adjoining Creighton on the south. This Mr. Hengstler later sold and moved to a timber claim he had secured on the line of the country a few miles south. Here by industry he prospered and added to his acreage from time to time until he acquired title to four hundred acres of excellent land in Knox county, and one hundred and forty adjoining on the south in Antelope county. Mr. Hengstler was married at Cottonwood Springs, August 19, 1868, to Miss Martha Zeff, daughter of Lorenz and Brigita (Geijer) Zeff who passed their entire lives in the old country. Mr. Hengstler's parents were Andrew and Ursulla (Fischer) Hengstler who lived all their days on a farm in the fatherland. To Mr. and Mrs. Hengstler five children were born: Lena, who is the wife of Fred Busch, of Creighton; Andrew, who is married to Miss Ernestine Horn, and who after disposing of a hardware business in Battle Creek removed to Creighton, where he lives on the income of several fine farms he owns situated further down the state; Martha remains with the old folks and gives them her tender care; John, who married Florence Rafferty, and William, whose wife was Bertha Schoenfeldt, occupy the home ranch. During the early years when times were hard, two cows with their cream and butter were the sole source of revenue to the family; butter was too precious for home use, all had to be sold to provide food; and Mrs. Hengstler being an expert butter maker, they always had a steady demand at good prices. Vegetables from the home garden were later a source of profit and much larger bunches of radishes and lettuce were given than we can secure now at the same price; poultry and eggs added their share of the family store. Industry and thrift brought their reward and Mr. Hengstler and family have prospered as they deserve. In coming to Knox county they drove across the open prairies with a yoke of oxen, from Cedar Bluffs. An old cow and a few chickens were their sole possessions in the way of stock. They lost crops year after year by the grasshopper raids, the grasshoppers being so revenous (sic) they even came into the house and gnawed holes in a coat hanging on the wall; a quilt that was spread over a garden bed to save it disappeared as rapidly as the vegetables it was intended to save. During the blizzard of October, 1880, three of the older children were at school but found their way home by means of a wire fence; the two youngest boys had a similar experience in the storm of January 12, 1888. Mr. Hengstler lost nine head of cattle at this time, a severe loss for him. There were a few antelope on the prairies when they first came, and our subject brought down one of them before they were all driven from the country. During the years of residence at Cottonwood Springs, buffalo were plentiful, and frequently a large herd of them would come down through the canyons to drink in the river. Mr. Hengstler's first dwelling in Knox county was a log house, but later a good frame building was erected - the timber having been hauled from Yankton, South Dakota, fifty miles distant. The cost of ferrying, a dollar each way, and two nights' lodging at hotels, made severe inroads into the slender purse of the settler. Mr. Hengstler was one of the first to cross the country to the Dakota capitol, breaking the road across the waving grasses of the prairies that had never before felt the pressure of a wheel. Corn and cornstalks as well as twisted hay were used for fuel in the early days; and Mr. Hengstler, to secure funds for provisions, often drove ten miles and cut a load of cedar posts and hauled them to Stanton, over sixty miles away, receiving but twenty-five cents apiece for them; sometimes he traded them to settlers on the way for corn to feed his team. But these hard times have passed away leaving but a memory. In 1900 Mr. Hengstler bought a cottage and moved to town; later he purchased a larger place, where fruit and berries abound and where he cultivates a fine kitchen garden. Mr. Hengstler is republican in politics, and with his entire family worships in the Lutheran church. Reuben Isaac Holeman, an active and energetic citizen of Custer county, is successful as a farmer and is always ready to do his part in any measure for the advancement of his county or state. He was born near Roseville, Warren county, Illinois, September 1, 1872, seventh child of Reuben Allen and Emily (Day) Holeman, who had three sons and five daughters. He was born and reared on a farm, remaining in his native state until 1877, when he was taken to Nodaway county, Missouri, and in 1883 to Taylor county, Iowa. His brother, John, came from Iowa to Custer county, Nebraska, in 1890, and Reuben joined him in 1892.
wife of Will Raybourn, living near Arcadia, has three children; Maggie, wife of Robert Hyde, lives in Sterling, Illinois, and has one child, and Reuben I., of whom we write in this sketch. Reuben I. Holeman has lived in Custer county since 1892 and is now a prosperous farmer and stockman. He lives on the south half of the southeast quarter of section five, township sixteen, range seventeen, and also owns eighty acres lying south in section eight. He devotes his land to grain and stock, his farm is well equipped, and he has a commodious and comfortable home. Mr. Holeman was married March 20, 1895, to Ada Maria Marsh, who was born in England, their marriage being celebrated at Broken Bow, Nebraska, and four children have blessed their union: Emily Jane, Lewis Ray, Reuben Allen, junior, and Leo Herbert, all at home. Mr. Holeman is interested in public matters and is now serving as a member of the school board of district number thirty-eight. A democrat in politics, he is a member of the Independent Order of Odd Fellows and Modern Woodmen of America. Harvey B. Andrews, a notable example of a self-made man, is known as one of the most successful ranchmen and farmers of central Nebraska, and has accumulated some seven or eight thousand acres of land, to which he is steadily adding. He has been a freighter as well as farmer and stockman, and both he and his wife are well known as pioneers, having passed through the days when Custer county was on the frontier. Mr. Andrews is connected with various banks and other financial institutions of the county and is a man of business acumen and keen judgment. He was born in Alleghany county, Virginia, January 22, 1849, sixth child of the six sons and four daughters of William and Elizabeth (Oliver) Andrews. The parents were natives of Virginia, where they were married and reared their children, and both died in that state. Four sons and one daughter still reside in Virginia. Mr. Andrews lived on the farm where he was born until leaving his native state in March, 1874. Then, in company with a party of about nine youths of that state, he came west into Nebraska, via the Union Pacific railroad to Kearney, where they hired a team and wagon, and with a driver came on to Loup City, Sherman county, and on into the territory of Custer, along the north side Middle Loup river, until reaching a point opposite the mouth of Victoria creek. They forded a river, no small undertaking at that time, and the wagon had to be taken to pieces and floated across, and the stronger men carried across on their shoulders those less able to make their own way over. In this way Mr. Andrews carried over Charles Matthews, who afterward became judge of Custer county and is one of the best known men in central Nebraska. After fording the creek they followed it along the east side until reaching Victoria springs. Of these nine who came on a tour of inspection, Mr. Andrews and Charles Matthews were the only ones who made a permanent settlement at Victoria springs, where they made their camp. Mr. Matthews took a pre-emption where the springs gushed out of the creek and Mr. Andrews took one a little farther up the creek, which later became the Bowley farm. In the fall of 1877 Mr. Andrews made a homestead entry in Cedar canyon, covering the principal part of the little cedar forest there, which was very valuable on account of the timber. Some of the cabins erected from logs taken from this canyon still stand on Victoria creek. Mr. Andrews and Mr. Matthews were the original settlers of their neighborhood, and well remember the time when big game were plentiful along the creek, and the Indians were sometimes troublesome when on their hunting trips there. Jacob Ross and family came to Victoria creek in June, 1874, and gradually others followed, the settlement growing from year to year. Mr. Andrews made his homestead in Cedar Canyon his dwelling place for many years, and there began the successful career he has since carried on. For many years he made his home at his ranch near Anselmo, known as Cedar Lawn, a view of which will be found on another page of this work. On September 29, 1878, Mr. Andrews married, in Loup City, Jennie daughter of Thomas and Elizabeth (Morrow) Loughran, who came to Victoria creek in 1876. Mr. Loughran had made a trip to the place in 1874, and at that time took up a homestead, bringing his family for a permanent residence there in 1876. He recently died in his eighty-sixth year, his wife having passed away some years before. Mrs. Andrews' parents were both natives of Ireland, and each had been previously married. The father came to Canada when but fifteen years of age, and married there, where his first wife died. The mother came when twenty-seven years of age, losing her husband and child soon after landing, they dying of "ship fever," supposed by many to be the deadly, contagious disease known as typhus fever. Her father sent her money to return home, but, being proud, she would not use it, and was working at fifty cents a week, saving her wages to take herself home, and, while thus employed, met and married Mr. Loughran, the couple later coming to the west. Mr. and Mrs. Andrews have had eight children, seven of whom now survive: William S., died in infancy; Mary, at home, filed on a homestead five miles north of Anselmo in 1903, and the year following secured four hundred and eighty acres under the Kincaid law, on both of which she made final proof; Charles H., has a Kincaid homestead eight miles north of Anselmo: Jennie. wife of John A. Mack, of Custer county, has three children; Lilly B., Alice, Fannie and Stella Minerva, all at home. These children were all born in Custer county. Mr. Andrews served some time on the county board as supervisor from the Victoria district, and has been actively interested in public matters. In 1874, he worked at freighting from Grand Island to Fort Hartseff, the military post above Ord, and he has always made the most of his opportunities for advancement along all lines, achieving a high degree of success from an humble beginning, and working hard for his start in the new country. In 1877, Mr. Andrews drove stage in the Black Hills from April 1 to September. During this time, the Indians, who were then hostile, often followed him. The driver of the stage the day before his run, was killed by the redskins, and another day his stage came to the mutilated bodies of two men and a woman, whom they had massacred. These incidents gave him no kindly feeling toward the Indians for many years. The first residence of Mr. and Mrs. Andrews was a log house, and later, on another place, their dwelling was a "soddy." Mr. Andrews has killed buffalo, deer and antelope by the hundreds. For ten years they had no other meat. At the time of the blizzard of January 12, 1888, Mr. Andrews had been to Broken Bow, and got off the train at Anselmo, where he tried to get a liveryman to take him home, offering five dollars for the six mile trip to New Helena, but no one would venture out in such a storm. Purchasing a lantern, he started out along a wire fence, and by the time he reached the end of it, he knew he could make his way on home, which he reached about ten o'clock, thoroughly frightening Mrs. Andrews by coming in at that hour on such a night. At the time of the blizzard of October 15 to 17, 1880, Mr. Andrews had just returned from the Dismal river, where he had a large lot of cattle. He felt the coming of the storm, and hurried home. Mr. Andrews was originally a democrat in politics, but is now independent of party lines. He is foremost in Masonic circles, being a member of the Broken Bow Blue lodge, chapter and commandery, and of Tangier Temple of the Mystic Shrine at Omaha with Mrs. Andrews and daughter, Lilly, he is also a member of the Order of the Eastern Star. In the fall of 1911, Mr. Andrews and family left their ranch at Anselmo, and retired to a farm adjoining the eastern suburbs of Broken Bow. 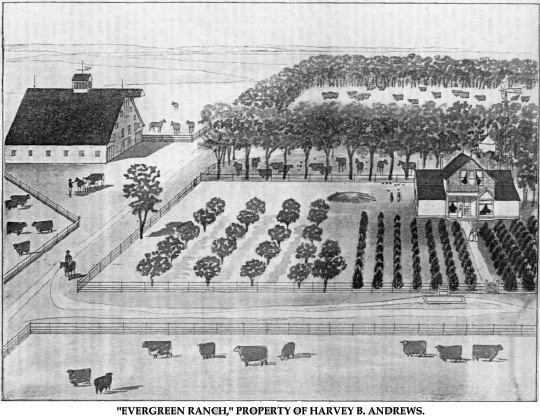 "Evergreen Ranch," Property of Harvey B. Andrews. Conrad Rosburg, for many years the leading carpenter and builder at Osmond, Pierce county, Nebraska, is a native of the province of Holstein, Germany. His birth occurred in the village of Harmsdorf, June 8, 1851, and he is a son of Wolf C. and Sophia (Ehrig) Rosburg. The former was born in 1804, and died in 1872, and the latter was born in 1809, and died in 1900, at the age of ninety-one years. Men of this family have been tenants of the same place since 1639, the date on the frame and concrete house built and occupied by a Rosburg, and handed down to succeeding generations. At times the race has seemed to be about extinguished, but it has been preserved, and none but men of that name have ever lived in the dwelling. Conrad Rosburg emigrated to America in 1870, sailing from Hamburg, Germany, on the eighth of June on the "Cymbria," which made the passage to New York in eleven days. He came direct to Benton county, Iowa, whither a brother and two uncles had preceded him. He was employed at farm labor until 1875, when, on March 5, of that year, he rented a farm in Crawford county, Iowa, and for five years followed the plow in that locality. Coming to Nebraska, he rented the Thompson farm, seven miles northwest of where Osmond now stands, and for nine years was a Nebraska farmer, and a successful one at that. It was during his occupancy of this farm that a sad incident occurred in the loss of two children in the memorable blizzard of January 12, 1888. The season of 1889, Mr. Rosburg spent on the road, traveling through Nebraska for the McCormick Harvester Company, and many are the tales he can tell of jokes and pranks played upon landlords and each other by fellow traveling men at hotels where he has sojourned. The work is exacting during the busy season, but they manage to have some fun along with their labor. In 1890, Mr. Rosburg erected the first building in Osmond, his present residence, the station having been established that year. For nineteen years he was a leading contractor and builder in Osmond, following that vocation until March, 1909, when he rented a farm near town, and again became one of America's producers. Mr. Rosburg is a good farmer, as the tract he took had been considered a rundown farm. His first crop, after thorough deep plowing, made a showing of fifty bushels of corn to the acre - this from land that had not produced a third of that amount for some years before. Mr. Rosburg was married, December 22, 1875, at Denison, Iowa, to Miss Hanna Fliss, a native of Cedar county, Iowa, and born near Wilton Junction, a daughter of Tobias and Sophia (Fallburg) Fliss, who were married in Germany in May, 1849. They were natives of Hanover and Brunswick, respectively, the father's birth having occurred near Frankfort-On-The-Main, and the mother's, in the village of Seliz. On coming to America, they lived in Chicago for a time, and, in migrating to Iowa, drove through with an ox team to Bloomington, Iowa, now known as Muscatine, which at that time was but a landing for the river steamers. They settled some twelve miles north of Muscatine, in the edge of Cedar county, and lived here until death. assistant, both in carpentry and building, and in his farming enterprises; Ella is the wife of Henry Martin, of Osmond; and Hanna Leneve, the youngest of the six children. Mr. Rosburg is, in general elections, a democrat, but votes for the best man in local campaigns, regardless of party affiliations. Many were the hardships endured by Mr. and Mrs. Rosburg in coming to Nebraska, and during their first years in the west. For five miles before reaching Onawa, where they crossed the Missouri river, they were compelled to drive through water in some places three to four feet deep. After crossing to Decatur, Nebraska, Mrs. Rosburg rode one of the horses, driving the cattle, and in the flooded road got into a ditch, in which she and the horse were submerged up to her shoulders. During the first few years, their only fuel at times was twisted hay, supplemented with corn stalks, corn or "buffalo chips." They came to Nebraska late enough to escape the last raid of grasshoppers, but were here during the winter of the deep snows, the winter of 1881 and 1882, when the last remnants of drifts lingered in the canyons and ravines until late in May. There were a few antelope to be seen in the country still, and occasionally a big grey wolf would appear, they having strayed out of the timber along the rivers out onto the plains. These were hard days - days that tried men's souls and women's fortitude. But the persevering ones, like Mr. Rosburg and his family, who endured to the end, have reaped rich rewards for their privations and strenuous labors. The west has been good to those who persevered. Captain Jacob A. Force, who departed this life May 29, 1893, was one of the leading old-timers of Howard county, and, with his family, had always occupied a foremost place in the affairs of that region. Mr. Force was a native of Wayne county, New York, born August 25, 1829, and his early years were spent in that vicinity. In 1849, he went to Corning, New York, and there made his home for about ten years, then returned to Palmyra. In 1862, he enlisted in the Twenty-second New York Cavalry, took part in numerous incounters of the war, and was finally injured badly, and received his discharge, whereupon he returned to his home, and remained up to the spring of 1864, at which time he recruited a company of infantry, of which he was commissioned captain, and, with his comrades, served until the close of the war. After leaving the army at the close of the struggle, Captain Force returned to his home, and shortly afterwards settled in Linn county, Iowa, and engaged in fruit growing and farming, combined. He got along very well, and made that state his home up to 1872, then came to Howard county, Nebraska, where he purchased a farm, lying one mile west of St. Paul. During Captain Force's early residence in this section, he took an active part in the upbuilding of the place, aiding in every way possible its growth and development. He was a republican politically. Captain Force moved to St. Paul in 1884, and from that time until his death, which occurred May 29, 1893, this was his home. Oscar E. Collins, a prosperous agriculturist, and one of the leading citizens of township nineteen, range thirteen, Valley county, is called one of the old settlers of eastern Nebraska, although he is one of the younger men in his locality. Mr. Collins was born in Marquette county, Wisconsin, April 11, 1870, and was eldest of eight children in the family of Warren G. and Amanda (Thurston) Collins, a sketch of whom appears on another page of this review. Our subject came to Valley county, Nebraska, in June of 1872, with his parents, he being only two years of age at the time. He grew up in Valley county, receiving the early advantages and schooling, and was raised on the farm. Mr. Collins has passed through all the Valley county years, and his faithfulness has been well rewarded, he now being a successful and prosperous farmer and stock man. He resides on the W. G. Collins stock farm, which is located in section thirty-two of North Loup township. The farm lies along the Loup river, and is a fine grain and stock farm. Mr. Collins was united in marriage on October 14, 1896, in North Loup township, to Miss Mary E. Jennings, by Elder Babcock, at the home of her parents, William and Lucy (Whipple) Jennings, who were early settlers in Valley county, but who now reside in Sioux county, Nebraska. Mr. and Mrs. Collins have had six children born to them, whose names are as follows: Duane, Vivian, Neva, Vida, Venard and Frieda, all of whom reside under the parental roof. Mr. and Mrs. Collins and family are well known, and enjoy the respect and esteem of many friends. Mr. Collins is independent in polities, and is a member of the Ancient Order of United Workmen. Mr. Collins remembers the days when deer and antelope were to be seen in great numbers on the hills. For many years the family lived in a dugout, and a truly comfortable dwelling it proved to be. ating a good farm. He is highly esteemed as a citizen, and has gained the confidence of his fellow men by his uprightness and honest dealings. Mr. Weerts has worked long and hard, and denied himself many things in days gone by, that he might become prosperous and a substantial citizen of Madison county, Nebraska, the scene of his early struggles and long labors, where he now holds the esteem of all who know him. Mr. Weerts is a native of Germany, his birth having occurred in Hanover province, March 23, 1863, a son of Frank and Rebecca (Ubben) Weerts, also natives of Germany. Mr. Weerts, our subject, grew to manhood in his native country, receiving the usual schooling, and at the age of twenty-three, was drafted as a soldier for the German army, serving ten weeks before coming to America. In 1888, Mr. Weerts left the fatherland for the new world, embarking at Bremen, Germany, on the steamship "Maine," landing in Baltimore, Maryland, after a voyage of thirteen days. After landing in the United States, Mr. Weerts at once proceeded to the far west, as Nebraska was then known, where he settled in Madison county, working at whatever he could get to do. In 1898, he bought his present farm from the First National Bank of Madison, and has steadily improved same until now he has a good home and farm, where he and his family live, and have a wide circle of friends and acquaintances. Mr. Weerts was united in marriage, February 22, 1893, to Miss Lizzie Van Deken, a native of Germany, and daughter of Johann and Hilga (Monk) Van Deken, Six children have been born to Mr. and Mrs. Weerts, whose names are as follows: Franz, Hilda, Johann, Herman, Eliza and Wallrich. Jesse Pierce belongs to one of the oldest families of Custer county, and one that has been active in promoting the progress and welfare of the region. He was born in Mower county, Minnesota, April 5, 1876, youngest of the eight children of James and Jane (Hunt) Pierce. A sketch of the father, who is now deceased, appears in this work. Mr. Pierce and his mother came to Custer county in the fall of 1881, when he was about five years of age, joining the husband and father on the homestead. He was educated in Nebraska, and lived on the home farm until the time of his marriage. On January 2, 1899, Mr. Pierce was united in marriage with Margaret Walden Knight, and on the day of their marriage, they moved to the sod shanty on his homestead, which was located on the northwest quarter of section thirty-one, township nineteen, range eighteen. He had flied on this land about a month before his marriage, and they have held continuous residence on the place since that date. He is one of the youngest among the original homesteaders, energetic and successful, having improved and developed his farm, which now contains three hundred acres of good grain and stock land. He has erected a comfortable modern residence to replace the sod shanty and he and his wife have a pleasant and well situated home. The place is well equipped with machinery and appliances and contains suitable buildings for housing stock and other purposes. Mr. and Mrs. Pierce have three children, all born on the homestead: James Gardner, Walden Knight and Robert Theodore. They are well known in various circles and are active in furthering the best interests of their community. L. Petersen, proprietor of a valuable estate in Pierce county, Nebraska, has been a resident of that locality since November, 1882. He is prominently known in that section of the state as one of the foremost farmers and stockmen, and after many years of hardships and industry has built up a fine estate, and is now prepared to enjoy the remaining years of his life in peace and comfort, surrounded by hosts of friends. Mr. Petersen is a native of Denmark, and was born in Moen, Elmelunde Sogn, Denmark, October 16, 1859. Perhaps part of our subject's success was due to the fact that he was a tiller of the soil over in the old country. He also was in the marine service in the army of his native country, during the years of 1878 and 1879. Mr. Petersen's father before him also served his country in the war of 1848 between Denmark and Germany. Mr. Petersen was married October 25, 1882, in Denmark, to Miss Mary Hanson, daughter of Hans Christian Anderson, a native of Denmark, and who also served in the war of 1848, between Denmark and Germany. Mr. and Mrs. Petersen sailed for America, November 1, 1882, leaving Copenhagen on the steamship "Island," and coming direct to Nebraska, settled on the west half of southeast quarter of section twenty-eight, where he planted three acres of trees, and then bought the land where he now resides. Mr. and Mrs. Petersen have been blessed with a family of three children, who are named as follows: Eldora, Arthur, William and Elmer C.
Mr. Petersen survived all the earlier hardships which beset so many of the brave sons of the frontier days, but on one occasion he felt doubt about ever seeing his family again; in the blizzard of 1888, he became lost in the storm while returning from Foster, Nebraska, where he had taken a load of grain, and had both of his hands frozen; he lost all of his crops in the memorable hailstorm of 1890.
church, and is affiliated with the Brotherhood lodge, and in politics is independent, voting for the best man. Mr. Petersen can well be proud of his life and achievements, and certainly is entitled to enjoy his latter days, knowing that he has done his share. The gentleman herein named is well known by the residents of Merrick county, Nebraska, as one of the leading old settlers of his locality, and a man who has done his full share in the upbuilding of the agricultural and other interests of his community. William M. Clark was born in Pennsylvania, July 1, 1847, and was the sixth of eleven children in the family of Benjamin and Maria Clark, who had seven sons and four daughters. Benjamin Clark and wife were natives of England. The Clark family moved to Will county, Illinois, from Pennsylvania about 1854, and there our subject attended his first school. Here they resided about three years, and then moved to Iroquois county, Illinois, where our subject lived on the farm until coming to Merrick county, Nebraska, in March, 1872. His brother, George A., had come here in 1871, and father, mother and brother, Oliver, came to Merrick county shortly after William came, and the father was an original homesteader. Here the mother died in the spring of 1876, and the father a number of years later, about 1897. William Clark took up a homestead on section eighteen, township fourteen, range six, in the spring of 1872, and he resided on his original homestead until the fall of 1910, when, having built a home in the Bascom addition to Central City, he moved to that place where he expects to make his permanent residence. Before leaving the farm he was one of the few pioneer settlers who still lived on their original homestead farms. Mr. Clark is a pioneer in every sense of the word, having passed through the years of drouth, grasshopper raids, and every other hardship and discouragement incident to those very earliest days of this part of Nebraska. On October 3, 1875, in Merrick county, Nebraska, Mr. Clark was united in marriage to Miss Emily Bovee, who was a native of Michigan. She came to Nebraska with her parents in the fall of 1872. Mr. and Mrs. Clark have had six children, five of whom are living: Minnie, wife of George Drye, has five children and resides in Wisconsin; Josephine, wife of John A. Dillon, has three children, and lives on his father-in-law's farm; Oscar R., is on the home farm; Florence A., deceased; and Lela Alice and Estella, who reside at home. Mr. Clark has a comfortable farm home and a well equipped farm, and he and his family are highly esteemed by all who know them. Mr. Clark has in past years served on the school board of his district, number fifty-six. John Bergstrom, a prominent farmer and stockman, living on section thirty-one, township thirty-five, range twelve, Boyd county, Nebraska, is known throughout the community in which he lives as a progressive and successful agriculturist, highly esteemed by all with whom he has to do. Although not one of the very oldest settlers of Nebraska, still in his nineteen years' residence here, Mr. Bergstrom has shown his worth and loyalty as a true citizen. Mr. Bergstrom is a native of Sweden, his birth occurring in the northern part of that country, in the year 1845; he is a son of Nels and Sigred (Nelson) Larson, both natives of Sweden. Our subject grew to full manhood in his native land, and in early boyhood received the usual advantages in his own country. In 1890, Mr. Bergstrom left his mother country, sailing from Guttenburg for the new world, and after a voyage of eleven days landed in New York, from where he went to the state of Washington. In 1892, he came to Boyd county, Nebraska, where he took up a homestead, and on this land put up a sod house, and later built a good frame residence. Mr. Bergstrom is a highly successful man, and now owns two hundred and eighty acres of good land, and a fine orchard of four acres. In 1907, Mr. Bergstrom returned to his birthplace on a visit, remaining two months, when he returned to the home of his adoption. In 1872, Mr. Bergstrom was united in marriage to Inga Christina Peterson, a native of Sweden, and Mr. and Mrs. Bergstrom are the parents of seven children, whose names are as follows: Annie, Hannah, Elmer, Hattie, Aggie, N. J. Joel and Bror Albin. Mr. and Mrs. Bergstrom and family are surrounded in their pleasant home by a wide circle of friends and acquaintances. William C. Emery, an old resident of Boone county, Nebraska, is a prominent Grand Army of the Republic man, highly respected throughout his section of the state as one of the foremost citizens in the agricultural and commercial life of that region. He has always taken a deep interest in the development of the locality in which he has chosen to reside, and to his individual efforts are due much of the prosperity now enjoyed there.